Jo: global warming tide is not turning, it has turned! 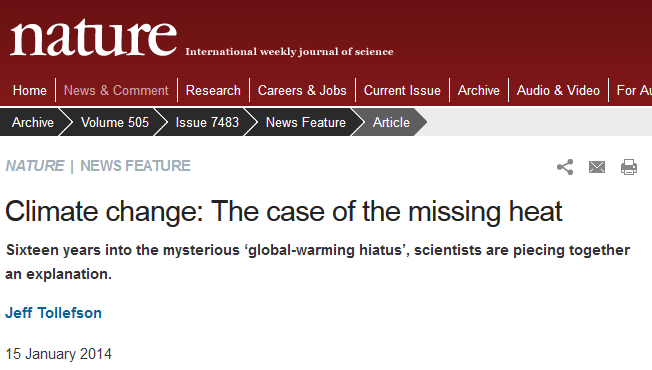 Will the global warming scam go out in a fizzle or a pop? Will it die a quiet death or will the media turn on those who fed this story and tear them apart. We are about to find out! Indeed, next day it turned out to be so vehemently anti-global warming that I felt that the article was too antagonist for some people on this blog and I closed the article for comments. Let me say that again: I closed discussions – not because me and my big mouth had said something far too provocative – but because the leading Scottish newspaper in what I have hitherto called “the banana republic of wind” was publishing sceptic views too provocative for my blog. On its own, I wouldn’t have paid the Scotsman article much attention as I stopped reading it when it never printed any letters I sent it. And what is one article, when the Scottish political elite are still vehemently hostile to sceptics? Although when I think about it, Murdo Fraser MSP did have professor Salby in the Scottish Parliament (much to the disgust of the green MSP). But still, one must not get too excited by a few small events (particularly one I organised). So perhaps the biggest shock was when the IPCC issued their report, who of all people, did the BBC – arguably the most pro-warming broadcaster on the planet – have to comment on it? Australian sceptic Bob Carter! That was exceptionally extra-ordinary. allows a skeptic to say the games up for climate hysteria! Something is really afoot. Three of the most ardently pro-warmist media outlets have finally given sceptics a voice. A high profile Sceptic was invited into the Scottish parliament. The climate talks last year fell apart, the Kyoto treaty is effectively dead, the world has not warmed for more than 15 years and the main stream media are showing a real interest in climate scandals. When the tide turns, the current stops going one way, sits idle for a while and then starts going the other way. So I would take issue with Jo when she says the tide is “turning”. The tide stopped going the way of the warmists, as long ago as Jokenhagen. It had certainly stopped going their way when the Kyoto commitment died at the end of 2012 as countries failed to agree a replacement. The tide has not been going their way for quite some time. So, it is not “turning”, it has already turned! We have already stopped this scam in its tracks and now what we are seeing is the beginning of a small but sustained movement the other way as this scam starts to unravel. I agree with Andrew Montford it really is time to Cue popcorn. And so time to bring up my favourite question: I have often wondered if this global warming scam would go out in a fizzle or a pop … whether it would die a quiet death being quietly forgotten like Swine Flu, the Millennium bug etc., or whether the press would turn on those who had fed them their stories, creating a feeding frenzy of news as they tap into hitherto untapped scandals to print story after story of headline news to basically tear apart those in science and public life who created this scam. I think we are about to find out. This entry was posted in Climate, Media. Bookmark the permalink. 9 Responses to Jo: global warming tide is not turning, it has turned! In N America climate alarmism is still alive and well. There is no mention of 28Gate in the news media here, or that other countries are abandoning the secretive wind farm and solar panel scams. They are simply carrying on like nothing has happened. In N America, disagreeing with Obama makes you a racist so the news media says nothing about anything, unless it has been OKd by Obama. We still have legislation left over from the acid rain scam that means we pay more for our energy than we should. That is nothing, and I do mean nothing, as compared to the clean up the GH “theory” based global warming scam will entail. Much will fall, how much??? Almost any trust we had in just about any “authority”, “expert”, “scientist”, “professor”, “politician”, and of course, bureaucrats…Particularly the UN. It will be “Hillsborough”, on a global scale. What I know HAS TO fall is reasonably well known (the faux “science” of GH “theory”), it is the ROOT CAUSE after all is said and done. “They” have been looking for a soft landing for some time now, Gore has abandoned carbon trading, media, to name just two. But, that is but the start of the rout. There will be many egos, reputations, and more, torn to shreds, and exposed as knowing liars and con merchants. Few were merely incompetent, most KNEW what they were doing… There is no way I can see it being a soft landing. Too many put all their eggs in this basket that they thought they had helped make too big to fail. In most other scares like this, the government have been able to just quietly end the affair leaving as you suggest, big chunks of policy in place. In contrast, I’ve seen the hostility of anti-wind groups and that will only get much worse when they realise that CO2 is not the problem they were led to believe. Unlike many similar scams where big corporations have been left paying, in this scam, it will be a sizeable group of wealthy country people who have a real and keen interest to totally wipe all legislation off the statute book. Indeed, I feel the really nasty fight could be at the end – after most other people think it is all over. I think it will slowly fizzle out. The green and alarmist tendency are becoming noticeably shriller and this is surely them shouting louder and louder in the hope that someone is still listening. The problem is the more extreme the message the more obviously silly they look to the bulk of the population. The politicians are a bit of a problem with Cameron wanting to “get rid of the green crap” while blaming the recent bad weather and floods on “climate change”. Clegg is a hopeless case while Ed “Climate Change Act” Miliband is presumably a committed warmist, although he doesn’t seem to be saying much on the subject – a quiet retreat perhaps? In Scotland Alex Salmond also seems rather quiet on the climate change issue and as the wiliest of the party leaders I suspect that he could be more aware of the way the wind is blowing (??) and I would look to him very quietly retreat. We do need to see more questioning papers from the scientific community and there does seem to be evidence that this is happening although I do worry that some of the scientific institutions are still operating bit of a closed shop. That said my climate hero of the last year has got to be Professor Chris Turney, who has done so much to publicise the truth about the state of climate science, and of the disappearing polar ice! Regardless of what various posters are arguing, The pause is now official. And if Nature argues it’s 16 years long, who am I to argue? It’s been a long time since publication in Nature made something official. These days, I suspect people pay more attention to what WUWT are saying. To put it another way … who cares what the people you pay are saying … it’s the voters that elect you that matter!